No woman can resist a black dress with pockets! 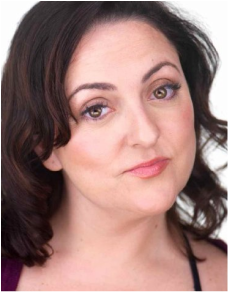 Amanda Barker is an actor, writer, director, and improviser. She has performed internationally for the last 3 years in the largely improvised SPANK! A 50 Shades of Grey Parody which won her 3 Broadway World Awards as “Best Actress” (Nashville), “Best Featured Performer” (Toronto) and “Best Colorado Debut” (Denver) and which she took off-Broadway and to Just for Laughs in Montreal. She is also well known in the world of radio, as a co-host for The “Humble and Fred Morning” Show on Sirius XM (Canada Laughs) and as a contributor to CBC’s “The Current”. An English/ Drama graduate from Mount Allison University in New Brunswick, she moved to Toronto to become Major League Baseball’s only ever female mascot for the Toronto Blue Jays. Recent Theatre Credits include: Moose on the Loose (Magnus Theatre), Miracle on 34th Street (Theatre New Brunswick, Sudbury Theatre Centre), The Best of the Second City (Second City Toronto), The Second City at Sea (Norwegian Cruise Lines), Tony N’ Tina’s Wedding (Second City Toronto), Dufflebag Theatre (International Tour), The Nutcracker (The National Ballet of Canada). TV and FILM credits include: Good Witch, The Case for Christmas (Hallmark Channel), Dino Dana (Nickelodeon), Paper Year, Saving Hope (NBC), 88 with Christopher Lloyd, ZOOM with Alison Pill, Get Set for Life (CBC), Video on Trial (MTV Canada) and as the re-occurring character “Frieda Fiver” on the Emmy winning PBS show, Odd Squad. Amanda is currently writing the 2016 show “Together for the Holidays” with Jan Arden and Sarah McLaughlan. Amanda’s play “Release the Stars: The Ballad of Randy and Evi Quaid” garnered international attention when the play’s subjects unexpectedly became part of the show at The Toronto Fringe in 2012. That piece went on to be performed at The Factory Theatre as part of the NEXTSTAGE Theatre Festival and as an official selection at Stratford’s Spring Works Festival. The play was included in the Association for Theatre in Higher Learning's Annual Conference in Orlando in 2013, the American Society for Theatre Research Conference in Dallas in 2013 and the Canadian Association for Theatre Research Conference in St. Catharine's in 2014. Amanda co-wrote the successful musical send up “SPANK HARDER!” which toured the US for six months in 2014. She is a contributor to Toronto Life, Chatelaine magazines and writes for stage and TV. She has directed commercials and hundreds of castings for commercial, TV and theatre in addition. Christopher Bond is best known for his work on Evil Dead, the Musical, a show that he developed with his partners and directed since 2002, including the show’s US debut Off-Broadway (nominated for an Outer Critics Circle Award for Best New Musical) and its return to Canada at the Diesel Playhouse (Winner of the 2007 Dora Mavor Moore Audience Choice Award) which also received a Dora nomination for Outstanding Direction of a Musical. Evil Dead, the Musical continues to play all over the world including productions in Korea, Japan, Spain, on the Las Vegas strip and touring across the North America with Starvox Entertainment. Other recent works include directing and creating new material for Starvox’s smash hit Trey Parker’s Cannibal the Musical, at the Panasonic Theatre, co-writing and directing the official stage adaptation of Night of the Living Dead, where Christopher collaborated with horror legend George A. Romero and also directing the National Tour of the Disney princess spoof, Disenchanted. Christopher’s writing and composition credits for the big and small screen, with co-writer Trevor Martin include A Little Bit Zombie, (Best Feature award at the 2013 Canadian Film Festival , Best Feature Fantaspoa Brazil, Canadian Comedy Award for Best Screenplay and currently being distributed by Anchor Bay Entertainment), PatchTown,(Best Feature at the 2014 Canadian Film Festival and distributed by Kino Lorber) and Acting Up ( upcoming original musical series created for the Corus network).